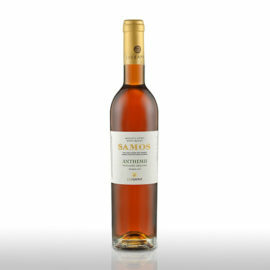 It belongs to the Vins de Liqueurs category and it is the most popular wine of Samos. It is the No. 1 sweet wine in sales in Greece and it is exported worldwide. From semi-mountainous and mountainous terraces. It has a light golden color and the nose is dominated by aromas of apricot jam and mature melon. A fruity taste with summer fruits in the foreground. 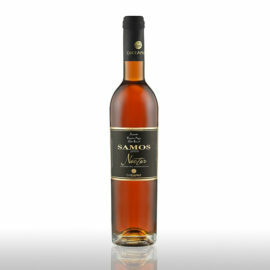 Served at 8-10 ° C.
Samos Vin Doux belongs to the Vins de Liqueurs category and is the most popular wine of Samos. It is not by chance that it is the No. 1 sweet wine in sales in Greece and that it is exported worldwide. 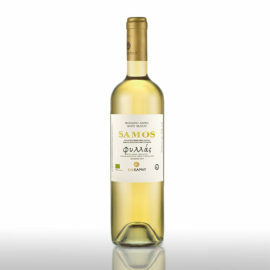 The Samian land, with the influence of the sun and the Aegean winds, raises the internationally recognized White Muscat in the semi-mountainous and mountainous terraces. 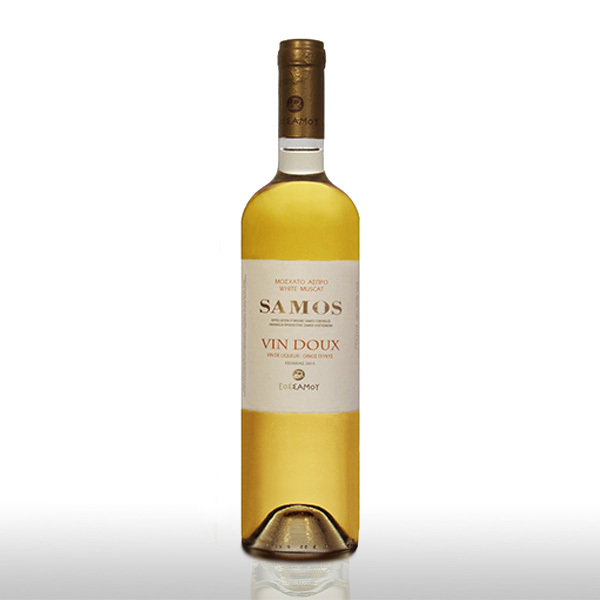 What makes Samos Vin Doux unique! Easy on the eyes with an attractive nose, it has a light golden color. The nose is dominated by aromas of apricot jam and mature melon expressing in a very fresh way the character of the Muscat grape, holding on to its primary aromas. The first contact with the mouth is explosive. A fruity taste with summer fruits in the foreground and with hints of butterscotch candy and flowers. A classic dessert wine, it is served after a meal at 8-10 ° C. It perfectly accompanies not only sweets that are light in texture and color, such as apple pie, lemon pie, fruit tarts, but also creamy desserts with full-bodied taste. It is also served as an aperitif or during relaxing afternoons with fruit, cheeses and nuts. It is the ultimate companion of mature melon and it is adored by desserts, cheeses, fresh or dried fruits. It is also used in confectionery to create tasty syrups that give a different twist to sweet creations. In cooking, it aromatically complements and “ties together” sweet and sour sauces. It also discreetly sweetens poultry, Asian or Italian recipes and other inspired dishes. It is the ideal closing of a meal or dinner, while its rich body can be a great base for making special Cocktails in unlimited combinations.